Thank you. It took a few tries to get what I like. I use a dry mix. Dark brown sugar and salt. Depending how long you leave it in the brine after it has gone wet/gooy, seems to make it like jerky. I always let it set up for 24 hours in the fridge after rinsing it off. Glaze with a splash of rum and Canadian maple syrup. I use apple chips. 2 pans. Let it go in the smoker for 4-5 hours, depending on the thickness of the meat. White fish season is soon here. Cant wait for some smoked whities. They are not bad smoked. Lakers that is. LOL I was just asking. I just started out with this smoker stuff. Grabbed a 20 year old little chief off a buddy. I like my steelhead jerky. Smoker never gets above 120 deg and does a nice job. That was cool,. I can see eating the beasts, please excuse my ignorance, but why a zebra ? This^^^^^^^^^^^^^^^^^^^ I could use in my flip hut. Wonder if the Canadian stores have the same deal ? One down the street here. Must go check. Thanks Chad No luck here. Theres a body bait from the past.AC Shinner. Great body bait. Not sure if any of the local tackle store where you are carry the Meegs line of spoons, but they work great . Hand painted in many combos. Watermelon and wonder bread are go too,s. Another is the silver fox. Great flutter spoon for those low speeds. 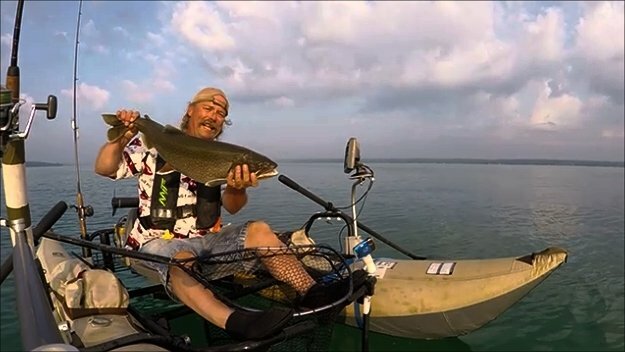 I am new here as well and there is no place for politics on a fishing and hunting board. There is other places for that. Thanks Decoy Hound and Chad. Right now it,s river time up here for me.Steel head and browns Hard water season is just around the corner. Awesome fish This is at the top of my bucket list. Now when the 2nd one happens, win lottery, I,ll be fishing them. That is a great buck. Nice harvest. Been lurking for a bit now, (ya me bad Chad) and well,time to get on a site that seems to have EVERYTHING. Here is a bit of what I enjoy. I am no pro vid guy. I have fun with what I do.